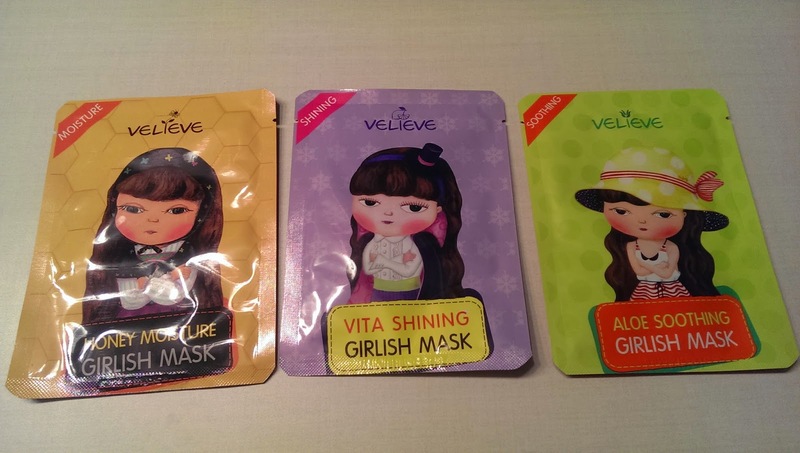 Velieve Girlish Mask ~ 3 for $7. I got "Honey Moisture", "Vita Shining" and "Aloe Soothing". Velieve’s Girlish Mask series comes in 4 different types each enriched with natural ingredients catered to target different skin care concerns – marine collagen for firming and tightening, honey extracts for nourishing, lemon extracts for brightening, and aloe vera extracts for moisturizing and soothing. The thin pulp type sheet masks adhere tightly to skin with ease and without any mask essence drooping down. I love sheet masks and the packaging of these ones are so cute! I usually use masks twice a week, so I will get to all of these. I just used the soothing one and it was great! 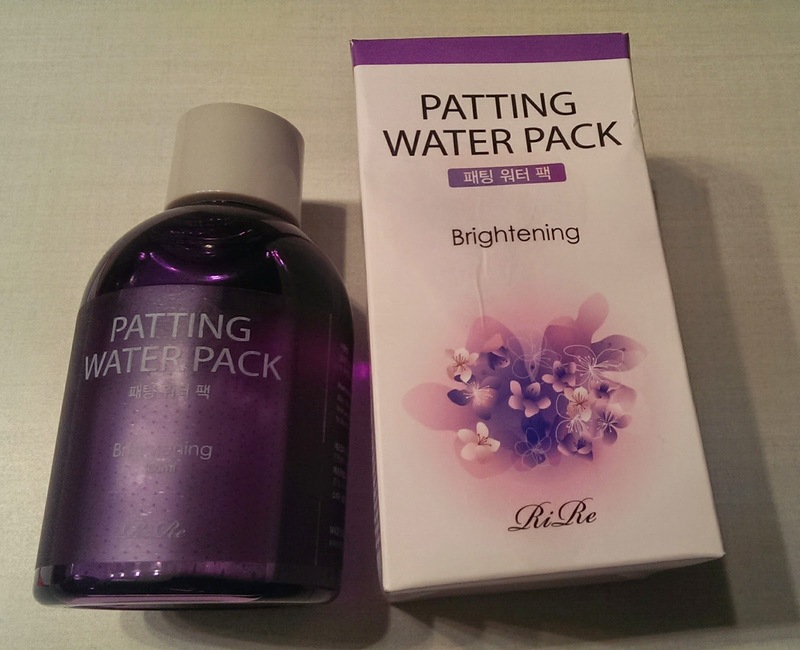 RiRe Patting Water Pack ~ full size $42. I received "Brightening". A new generation of ‘patting water packs’ that works miraculously to balance skin’s PH level, gently melt away dead skin cells, and ultimately enhancing skin tone and texture to reveal clearer, smoother complexion with continuous use. The purple Brightening pack bases its formula on violet extracts which help to balance and brighten uneven skin tone. To use - you first was you face, then fill a bowl 2/3 full with water and add 1 or 2 capfuls of the Patting Water Pack. Mix in the water and then pat the mixture on your face 15-20 times and don't rinse your face after. This is an interesting idea, I'm not sure how many days I will have time to add this my skin routine but I will give it a try! 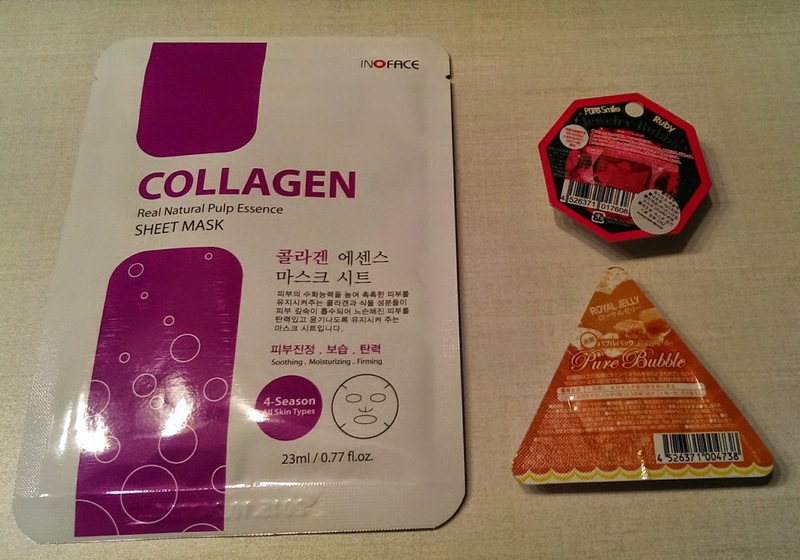 Inoface Real Natural Pulp Essence Sheet Mask ~ $2. 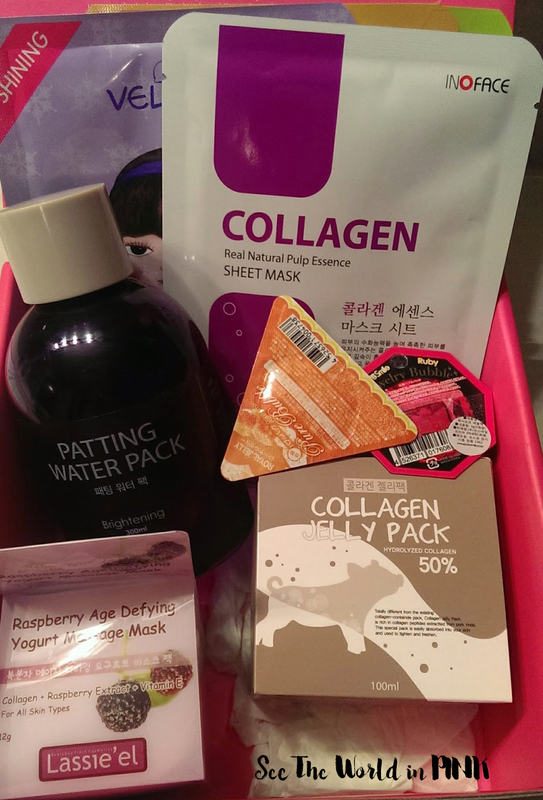 I received "Collagen". Replenish moisture and firmness to dry, sagging skin with the Inoface Real Natural Pulp Essence Sheet Masks each formulated from the concentrated essence of natural ingredients – snail mucus, Q10, collagen and aloe extracts. These masks are composed of highly effective skin soothing, moisturizing, and firming agents and are suitable for all skin types and for all 4 seasons. Again, sheet masks are always a win for me! Pure Smile 'Jewelry Bubble Ruby' & 'Pure Bubble Royal Jelly' ~ $2 for 2. These two wash-off facial packs are each formulated from concentrates of ruby extracts and royal jelly extracts. The Jewelry Bubble Ruby pack is a skin soothing and replenishing formula that consists of ruby powder, green tea, hyaluronic acid, aloe vera leaf, glycerin, vitamin E, and portulaca extracts. The Pure Bubble Royal Jelly pack is also enriched with over 40 kinds of vitamins and minerals and helps treat acne-prone skin types by deeply cleansing the pores and nourishing damaged skin. To use these, you apply the bubbling gel pack and scrub the bubbles in. When it stops bubbling, rinse off. These sound fun - I have not tried them yet, but I definitely will! 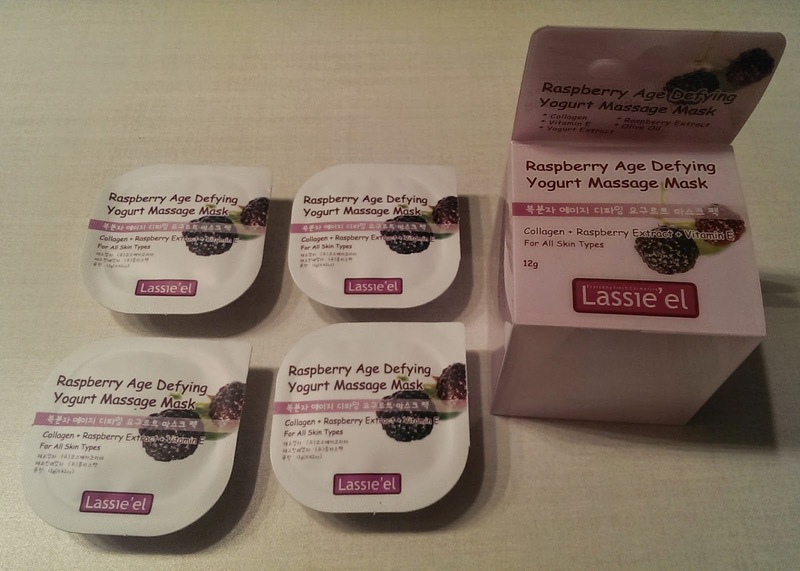 Lassie'el Raspberry Age Defying Yogurt Massage Mask ~ $6. Deeply replenish and revive dry, dulled skin with a rich blend of yogurt extracts that effectively sloughs away dead skin cells and skin impurities from the pores and prevent oxidation of the skin. The yogurt formula consists of lactobacillus, raspberry extracts, and collagen extracts which all work to fight and diminish appearance of wrinkles and sagging, aging skin. Apply this to face and massage in to skin until micro-beads disappear into skin - leave on for 5-10 minutes as rinse off. If you do not use all in the pack, there is a lid so you can seal it up and store it in the fridge. You apply this to your face and massage until absorbed in. 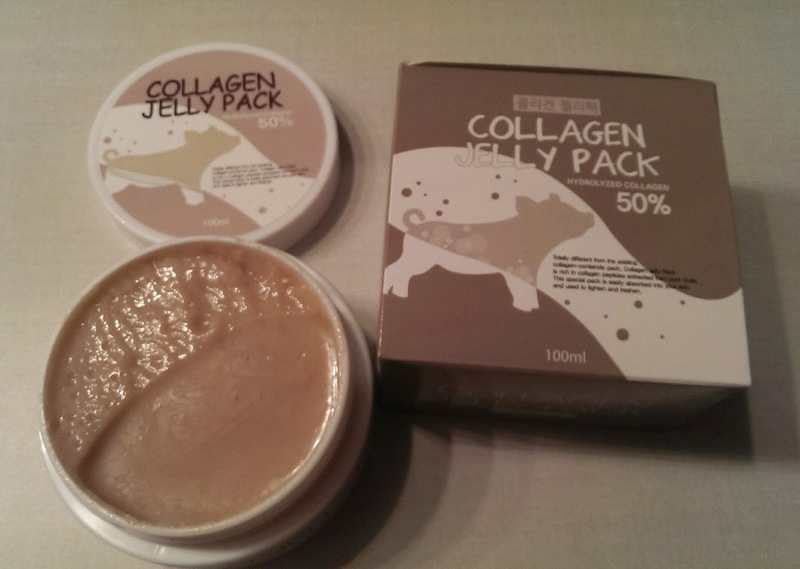 I know people are mixed on the use of collagen and how much it actually works - I think it is interesting and maybe worth a shot?! Altogether, the Winter Essential Masks Box, had a value of $72 and had so much variety! I am really happy with the products and there are so many new masks for me to try! If you are interested, this box is still available on the Memebox website, and it may not last long! If you are interested in viewing my other Memebox reviews, you can see them here. What did you think of the Winter Essential Masks Box?